This is a guest post from Shodo Spring, a Zen priest who has dedicated her life to socially engaged Buddhism. Shodo is a trained therapist, mother of two, and grandmother of four, who received priest ordination from Shohaku Okumura. She recently sent me this account of her time in Washington, DC, where she took part in the Tar Sands action, and I wanted to share it with all of you. Leaving Washington after ten days in front of the White House, I ride the train through hills and mountains – Maryland, West Virginia? I look out on trees, rocks, river as: wide river, shallow with rocks, winding, here and there a small island; now an old stone building, a wide field, a farm; now trees again, roads, farms. “Beautiful,” I think. There’s a bit of mist, now turned to rain streaming down the windows. Across the aisle a baby is entertained by his mother. This is what it is about: that life should continue. Perhaps I should say, life as we now know it. The teaching says, “Accept what is offered,” but I am not yet able to accept the end of human life, the end of trees, of rain, of deer. I am worried at the loss of insects. Suddenly I remembered that ten, twenty years ago, driving a car in the summer meant a windshield splattered with insects, frequent scrubbing and cleaning of their dead bodies – and this is no longer true; the insects are nearly gone. What else is lost, will be lost every day in this great extinction? How can I come to terms with it? Now I study what it means to free all beings. It’s not a physical thing, yet it does not allow me to cooperate with the destruction of millions of lives, millions of points of awareness. My life does not belong to me. This action was about the Alberta tar sands, specifically about the plan to put a pipeline from the tar sands to Canada, through the middle of North America, through wilderness, farms, ranches, mountains, and the Ogalalla aquifer. Every day groups of us stood or sat in front of the White House and got arrested for disobeying police orders. It was all very polite and civilized, though uncomfortable. Most of us paid our bond and left in a few hours, never seeing the inside of a jail. In 14 days, 1252 people were arrested. Most people came and left in 3 days; some stayed to support or volunteer. 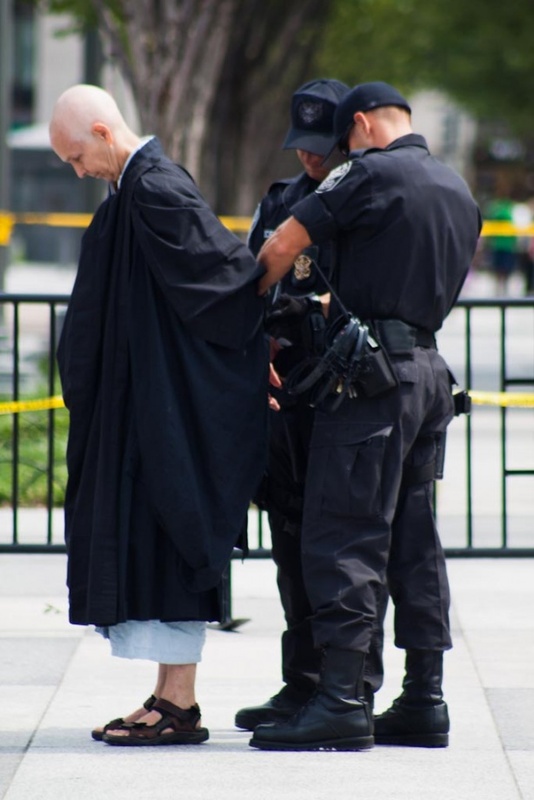 On the “religious leaders” day I spoke for Buddhism and got arrested in full robes. 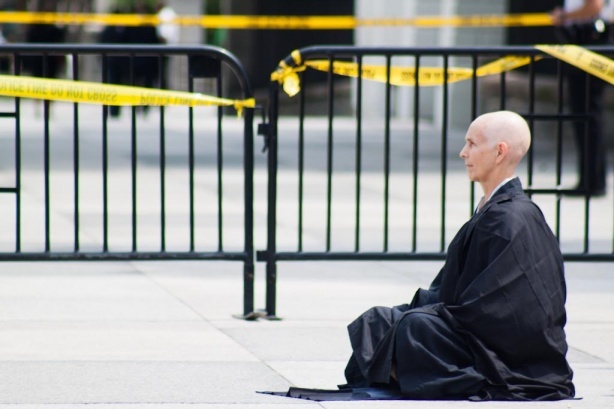 On the other days I sat zazen an hour or so on, facing the White House. During my ten days, I talked with a photographer. He was doing a documentary. He’d been to the tar sands region, and to places where pipeline spills had happened, and to refineries. Each place, people described the same illnesses and the same destruction of their landscape, of their water, of their way of life. At the tar sands, the Cree have lived off the land for thousands of years. To be unable to eat the moose because the moose are cancerous; to lose the boreal forest which is their identity as well as their livelihood; to have no drinkable water that is not flown in – how does this compare to simply watching your children, brother, sister, uncle, mother, best friend get cancer – as in the other locations. I would not want either for my grandchildren, or my children or myself. Or for anyone, including moose, voles, willows, or ravens. The pipeline will increase the output of the tar sands by 30%. The sands will be processed to turn them into something resembling oil, then piped across Idaho, Montana, Nebraska, the plains (over the Ogalalla aquifer on which the Midwest depends for water) down to refineries in Texas to be sold to the highest bidder. Each barrel of oil, before piping, will be processed using 4 barrels of water and 1 of natural gas – sometimes from fracking, sometimes not. The economy does not distinguish; money does not value the lives of humans or moose, moss or polar bears, soils or forests. Oil from the tar sands, for all these reasons, contributes much more carbon dioxide to the atmosphere than ordinary “light sweet crude” which we have nearly used up. The climate is already changing – hard to deny that in this year of floods, droughts, and hurricanes – and if we continue to develop the tar sands, we invite ever-faster change and invite the point of no return. Talking about this always makes one sound over-dramatic, even hysterical. I will simply mention some resources for more information. The way Zen practice appears in my life is twofold: sit zazen, care for the earth. This allows a lot of space. I am working toward creating a land-based center that will include sitting, permaculture farming, and community engagement. I have done actions called pilgrimage, public zazen, and more conventional activism. When I ask myself how best to care for the earth, the conclusion is always the same: deep cultural and spiritual change. Conveniently, that’s my profession as a Zen priest. Inconveniently, it is not something that can be done. I face it as well as I can. A hunger striker stands daily in front of the White House, his issue the same as ours: destruction of life on earth. His critique of our action: superficial, inadequate, egoistic. His proposed strategy: awaken hearts through thousands of hunger strikers. My critique of his method:: it would be good, but won’t happen. His eyes are clear and bright. From a distance he looks crazy. One morning, 15 of us sat on the sidewalk facing the White House, entering relationship with a single person who seems to have great power. The other days, dozens of people sat or stood on the sidewalk facing the public, chanting and singing, being arrested. Both were powerful. 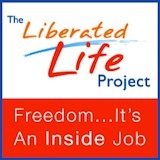 The first is the path to which I belong: relationship, intimacy, being present. http://conversationsearth.org/ – click “stories” at the top to see video reports from traditional peoples on effects of climate change. On the day it rained, I saw these at the Native American Museum. Heartbreaking. Posted in Environment, Guest Post and tagged Athabasca oil sands, Zen. Bookmark the permalink. this piece — the words and the action — are deeply moving. thank you for continuing to share these stories and the people who live them. This is quite beautiful … and forcing a pause into my morning, a shift in my awareness. Just a few hours ago I was contemplating what the earth would be like for my children, how my actions of driving would influence the yard that my grandchildren are given in which to play. Thank you for your awareness, for your actions, for you…for us. Not mentioned in this excellent editorial is the fact that the tar sands passed out of Canadian hands under NAFTA, and joined a long, long list of our rightful national wealth (I’m Canadian) that is no longer “ours” under that dishonest programme. Now we see a proposal literally to pipe these hydrocarbons straight out of our soil and into the United States. The ongoing, debilitating attack on Canadian sovereignty and our ability to provide for our families and society as an independent nation is yet another facet of this smelly proposal.